baking basics: brownies — Mel bakes things. I've decided to incorporate a little something new into this whole blog thang (yes, thang.) As a long-time reader of quite a few blogs out there, it has become more and more apparent by reading comments and such that sometimes, people don't want super difficult, overly-fancy recipes. Sometimes, y'all just want some basics. Maybe you don't cook or bake on the regular and are just trying to learn some easy stuff to impress yourself / your friends / your family / your partner / that person you think is cute, or maybe you just want a good solid base recipe for something, or you want to learn the method for something...and you should be able to find/do those things! It's totally okay to be new to this whole baking/cooking thing. It's okay to just want a plain old ____ recipe once in a while. It's okay to not really know how to brown butter or make frosting or work with yeast. So, I'm going to start a series of basics, geared toward helping anyone who falls into those categories above. Now, you should know: I am no authority. Everything I've learned, I've been taught by family/friends or have learned on my own with practice and experimentation. I don't have a culinary school education backing me up, but I don't think you need one to be good at any of this anyway. I read a lot of cookbooks and blogs and magazines, and I cook or bake several times a week. Really, the recipes and methods I share with you throughout this series are simply things that have worked with consistent results for me in the past. Recipes or methods I turn to regularly, and think you might find useful. Cool? Cool. So, let's start with brownies. This particular recipe yields brownies that are fudgy and deeply chocolaty, but not overly dense. They're also not overly sweet, which lets the chocolate flavor shine through and makes them a good candidate for adaptation once you've mastered the basics. They're just rich enough, which really just means you can get more out of one recipe because you can cut smaller squares. 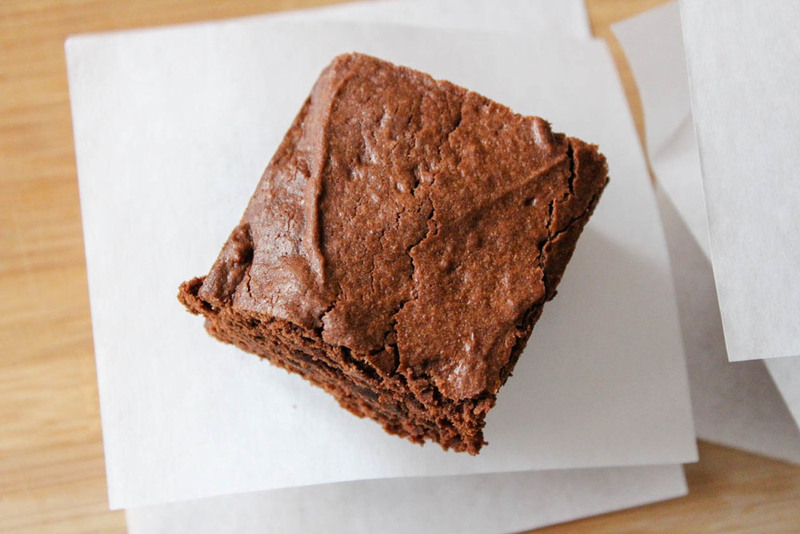 One thing to remember: the higher quality your chocolate, the tastier your brownies will be. Method: Here's a sort-of step by step photo tutorial to give you a better sense of what the brownie-making process looks like...the full recipe is listed at the end of the post. Step 1: Get your dang ingredients ready (mise en place!). For reals. It makes your life SO. MUCH. EASIER. when you have everything already measured out and ready to go. This also prevents you from getting halfway through a recipe and then realizing you're out of some ingredient or another and have to take a "quick" trip to the store. Step 2: Prepare your pan. In this case, line an 8x8 pan with parchment (foil can work too), and spray lightly with non-stick spray. This is a good time to preheat your oven to 350F, too. Step 3: Melt your chocolate and butter. I prefer to do this via the double-boiler method, but you can also do it in the microwave. To create a double-boiler, simmer 2 inches or so of water in a saucepan. Place a heat-proof bowl on top, add your chocolate and butter, and stir frequently until butter and chocolate are melted and smooth. Then, turn off the heat, and remove the bowl of butter/chocolate from the saucepan (carefully, please, as it will likely be quite warm). Step 4: Whisk cocoa powder and espresso powder into your melted chocolate mixture. Step 5: In a separate, medium/large bowl, whisk together eggs, sugar, salt, and vanilla until thoroughly combined. Step 6: Whisk your melted chocolate mixture into the eggs. Do this slowly, so the eggs can gradually come up to meet the temperature of the chocolate. If you dump it all in too quickly, you might end up scrambling your eggs. Gross. Step 7: Stir in your flour until just combined. Step 8: Pour your batter into the prepared pan, and even out with your spatula. Step 9: Bake for 32-40 minutes, until a toothpick inserted into the center comes out with just a few moist crumbs (no goopy batter!). Get fancy: Once you've got the basic recipe down, start jazzin' it up. Mix 8oz of cream cheese with an egg, some sugar, and some vanilla and swirl that into the batter before you bake for cream cheese swirled brownies. Add chopped Andes mints. Add cinnamon and cayenne for a Mexican hot chocolate vibe. Swirl some peanut butter or nutella in the batter. Add chocolate chunks or chips. Add toasted nuts. Frost them, once they're cool. You can also do what I did below, and add some chunks of cold salted caramel (totally stole that idea from Deb over at Smitten Kitchen), which resulted in some insanely delicious, structurally-questionable brownies. See? Lots of ways to amp up a basic recipe like this. Preheat your oven to 350F, and prepare an 8x8 pan. Line pan with parchment or foil, and spray lightly with nonstick cooking spray. Set aside. Melt butter and chocolate together in a double boiler (or by microwaving in 30 second intervals and stirring between each). 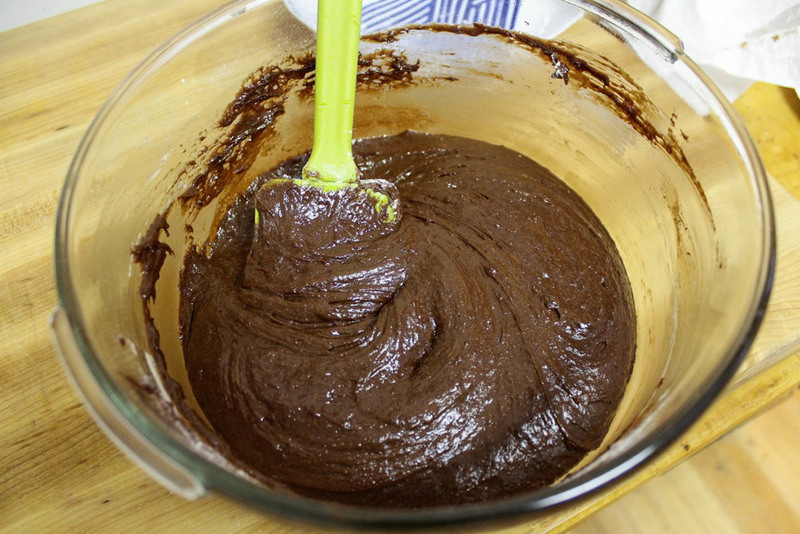 Once butter and chocolate are smooth, whisk in cocoa powder and espresso powder. Set aside to cool slightly. In a separate medium/large bowl, whisk together eggs, sugar, salt, and vanilla until combined thoroughly. 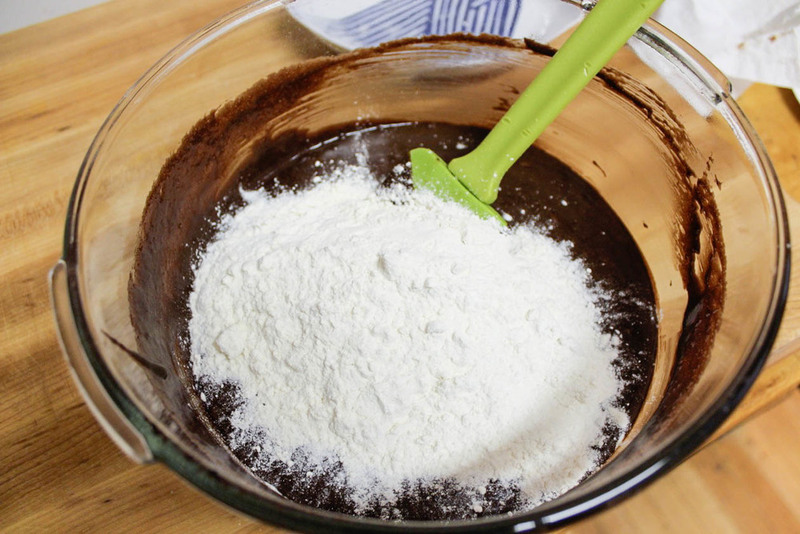 Slowly drizzle your chocolate mixture into your egg mixture, whisking all the while. Do this slowly, as you want to gradually bring the egg mixture up to temperature. If you just dump all the chocolate in at once, you'll scramble your eggs. Pour batter into prepared pan, and even out with a spatula. Allow to cool for at least 1 hour before removing from pan, using parchment or foil lining as a sling to help you. Cut brownies into desired size pieces (I suggest waiting til they are completely cool to do this, though you may not be able to control yourself...its okay, I understand.) Store in an airtight container, once completely cooled.